I had the pleasure of chaperoning my twin daughter's kindergarten class field trip to Whole Foods today. I was so excited to see what their tour would be like and what they would learn about healthy eating. 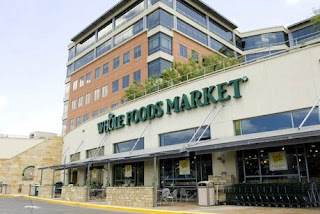 In the end I decided I would write about our lesson as a reminder to all of us how important organic whole foods are to our bodies and our environment. And, how to talk to our kids about this subject. It all started with the introduction of our tour guide Mike. He is, of course, a Whole Foods employee in charge of marketing at the store we were visiting. He was great with the kids and you could tell really enjoyed giving tours. Our first stop was the skincare section of the store where Mike explained that anything that is put ON your skin ends up IN your body so it is important that it be natural and organic. He went on to ask the kids if they new what organic meant. There guesses were pretty good and I thought his explanation was clear. Organic means that it is 'from the earth'. It is natural, without added chemicals and the basic ingredients are unchanged. Next we moved on to the produce section. Mike explained how it is important to eat a rainbow of colors. Not only to make sure you are eating different kinds of food, he explained that even different colored apples (green, red) provided slightly different vitamin and mineral levels. He quizzed the kids on what some of their favorite green, yellow, orange and red veggies were. It is hard to keep track of what is a fruit and what is a veggie sometimes, but they did great. We also talked about why it is so important to buy our fruits and vegetables locally. He showed the kids a section full of Michigan grown apples, squash and pumpkins. They picked up on the fact that food sitting on a boat or trucks for weeks vs. hours makes a big difference in freshness. At the fish counter, our tour guide was trying to make a point about the importance of sustainability. He asked how many of the kids had ever been fishing before, most raised their hands and what you do when you catch a really small fish. One of the boys answered 'throw it back.' This was exactly what Mike was looking for. He then asked if anyone knew what sustainable meant. This was my favorite part of the whole experience..."when you get something on your shirt and you have to wash it off" one of the other boys answered. How cute is that? Never fear, they ultimately learned that sustainability means that we should never go out and catch all of the fish. We need to save them for the future. We talked about meat and how important it is (if we are meat eaters) to eat meat from animals that are allowed to roam free, not be kept in tight cages. The tour guide compared chickens to the kids, calling them 'free range' kids. Along the way there were samples of gum drops, sushi, bread and really yummy gelato. The kids had a great time and learned a lot about not only what to eat, but why it is so important to be aware of where your food comes from. I am sure all of the whole food stores offer this service and I hope that you and your teachers will take the time to take a tour. What a brilliant idea! I think all kids should go on field trips like that! Aw that's awesome! I love that idea. What kind of school do your kids go to? I got to do cool things like that when I went to Montessori for a few years. Public schools...not so much. My kids actually go to a small Catholic school that is in the process of earning their International Baccalaureate certification so they do some cool things. Also their teacher has her undergrad degree in dietetics (sp?) which doesn't hurt. The kids just finished a unit on the 5 senses so visiting the store actually tied in quite nicely. They smelled, saw, tasted and touched lots of great things.